What Are Ready-Made WordPress Websites? 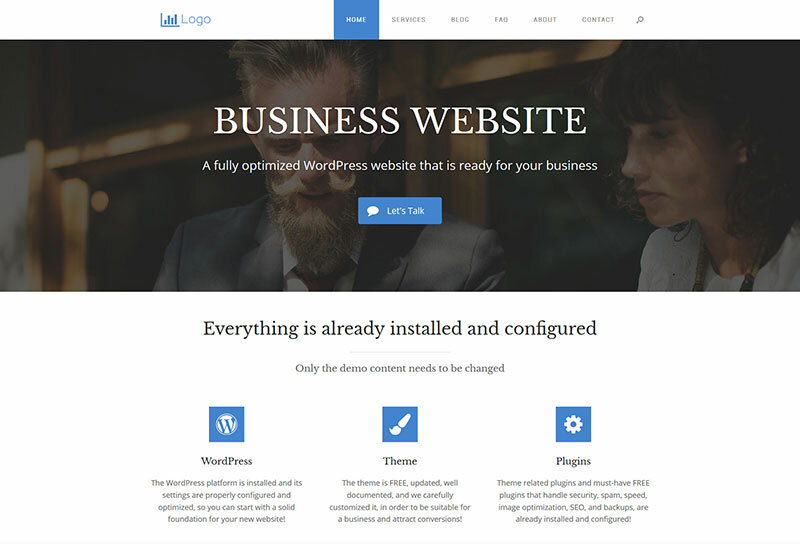 By ready-made WordPress websites, I mean that, except for the dummy content and several site-specific settings, everything else is installed, configured, and properly optimized on an existing web host. WordPress is installed and properly configured, so you can start off with a good foundation for your website! A WordPress theme is installed and configured. Free themes are used to avoid any licensing problems. And it won’t cost you extra money either! You can always upgrade to premium after, if you want to. Useful plugins, theme-specific plugins, and must-have plugins that handle security, loading time, backups, SEO, spam, optimization/performance, are already installed and configured! The must-have plugins that are usually used are: Yoast SEO, iThemes Security, W3 Total Cache, Spam Destroyer, WP Smush, UpdraftPlus, Redirection, Revision Control, Social Warfare, WP Forms or Contact Form 7. The plugins are free, so you won’t need to pay anything unless you want to upgrade to premium. To make sure that your theme looks as good as possible, minor CSS modifications were made to it, when needed, which fixed certain bugs or improved the design on both desktop and mobile devices. When customizing and optimizing a WordPress website, quite a lot of time is invested in it. At least that’s how it’s done here at ThemeSkills. Everything is carefully chosen and attention to details is paid (e.g. fonts, font size, colors depending on the niche, etc. ), using a combination of persuasive design and psychological triggers in order for your website to be ready to convert. 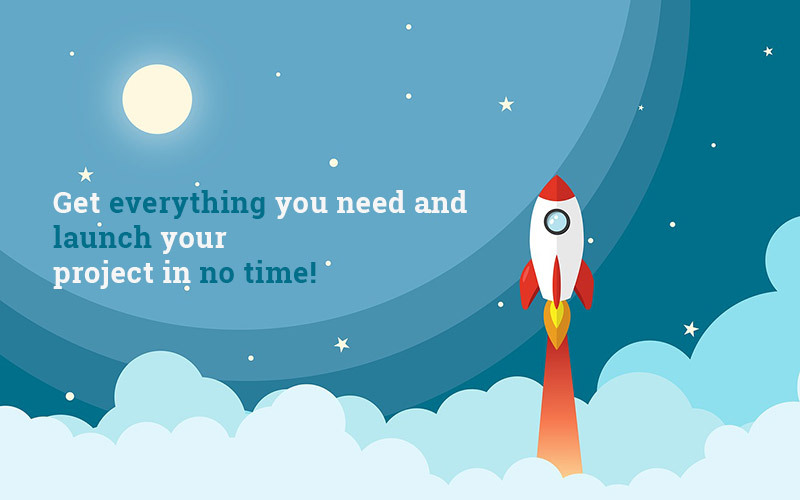 Gaining time – Since you purchase a ready-made WordPress website and a hosting at the same time, you could even launch your project in one day! 3 in 1 – You get a fully optimized WordPress website, a good hosting on AWS, and on-going support! Clean install – No bloat from installing demo theme content (plugins, pages, posts, images)! ReadyShip.co is a managed WordPress hosting service, which also lets WordPress website creators like me to use their platform to sell ready-made WordPress websites as a service. So, everything will happen on this newly launched project, ReadyShip, not on this website. Basically, a WordPress website or blog is created from scratch by me, for a certain niche, directly on ReadyShip. A good theme is picked, proper plugins are chosen, and then the WordPress website customization starts to offer a modern, persuasive, and conversion-centered design for different projects. If you want to start a WordPress website for your project and believe that the website I’ve created (see below) would be a good fit, you can choose a subscription plan from ReadyShip for it, which will also include the AWS hosting. After that, they will clone the WordPress website on your domain. You can have your site on a ReadyShip sub-domain or you can have your own custom domain. So, you won’t just get a WordPress website, you’ll get a hosting for it too! Killing two birds with one stone, right? Or three, if you count the on-going support as well! ReadyShip offers a fully managed WordPress hosting on AWS (Amazon Web Services). They host WordPress websites on ECS Container pool supported by extra-large servers. After everything is cloned on your domain and ready to go, you just have to replace the dummy content and several settings mentioned on the product page, and then publish the website. Since a part of the monthly subscription goes to me as well, not just for the hosting, I think it’s fair that I provide on-going support for you! The on-going support will be limited to answering questions, providing guidance, and minor modifications. ReadyShip also offers support related to their platform and hosting infrastructure. Below, you can see the ready-made WordPress websites and details about them. Want this website for your project? Then wait no more! Click the button and launch your business website in no time! This is a corporate WordPress website designed for businesses. A combination of persuasive design and psychological triggers were used, in order for the website to be optimized for conversions – in this case, for the potential customers to get in touch with you. A large font size was used to stand out and draw attention. The color blue was picked as the dominant color, which is suitable for businesses. It’s considered that blue stands for trust, strength, and reliability. You might have noticed that many well-known businesses use the color blue (e.g. PayPal, Facebook, General Electric, etc.). Different call-to-action features were also used throughout the pages. For this project, a free theme called Vantage was used, which is developed by SiteOrigin, a well-established WordPress creation studio. Supported – even the free version. The theme also comes with its own page builder and widgets. So, as you can see, the theme was carefully checked before being used. You can rest assured that’s not one of those poor-quality free WordPress themes. Several CSS modifications were performed to fix some bugs and also improve the design for both desktop and mobile devices. Social Warfare – social sharing buttons for your blog. SiteOrigin CSS – an advanced CSS editor. Want to have a WordPress blog like this? Then wait no more! Click on the button and start blogging in no time! This is a ready-made feminine WordPress blog. The blog already has everything installed, configured, and optimized: WordPress, theme, plugins, and design. The only thing remaining is to replace the dummy content with your own content (pages and several posts), and I can do that for you, if you wish so, because free support is included. Two categories were added: Fitness and Nutrition, but they are for the sake of example, it doesn’t mean that the blog is only meant for those niches. It’s suitable for whatever you wish: travel, fashion, lifestyle, etc. For this project, the free version of a theme called Kalon was used, which is developed by Rara Theme. Simple Author Box – adds an awesome author box at the end of your posts. Want this website for your World of Warcraft guild? Then wait no more! Click the button and get your WoW guild website launched in no time! This is a ready-made WordPress website designed for World of Warcraft guilds, where you can present your roster, raiding progress, Twitch channel, etc., and also recruit new members! The website already has everything installed, configured, and optimized: WordPress, theme, plugins, and design. The only thing remaining is to replace the dummy content with your own content, and I can do that for you, if you wish so, because free support is included. For this project, the free version of a popular theme called OceanWP was used, which is developed by Nick. Several CSS modifications were performed to improve the design for both desktop and mobile devices. WP Responsive Recent Post Slider – adds a slider to your homepage with your recent blog articles. Ocean Social Sharing – adds socials sharing buttons for your blog posts. WoW Progress – displays the progress you’ve made on different raids. YouTube videos can be added as well.